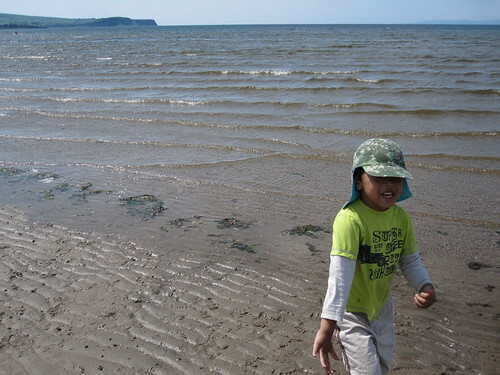 We just got back from Ayr in Scotland. We had driven there this weekend with another Son-Rise family to see Ian Jordan who has an optical practice there. "Why travel so far just to get Imaan's eyes checked?" you may ask. Well Ian's practice, besides offering normal eye examinations and dispensings also offer specialist interventions as well. Ez made the decision to go to Scotland to see Ian following the Treating Autism 2011 London conference held at Queen Mary, University of London last month. Ian was one of the speakers at the conference and he talked about "how children with ASD can be helped with vision problems that can otherwise significantly impact their quality of life". Imaan appears to have some eye problems but so far all the eye specialists we have seen before have not been able to give any conclusive findings due to fact that he is non-verbal and/ or they did not know how to handle him. It was a long journey and we passed some very beautiful scenery. However we didn't have much chance to enjoy the scenery. We stayed for the night at the Travelodge at Ayr. On Monday afternoon we parked at short stay car park at the town centre and walked to the practice at Newmarket Street. The practice was not as big as I had expected it to be. First of all we went to a small room to have Imaan tested for long-sightedness and short-sightedness followed by test for colour blindness. His eye lit up when the lady pressed a button to raise the chair and was really disappointed when she turned off the power though he did press the button from time to time just to check whether it was working again. Anyway he did fantastic with the tests and we were quite surprised that he recognised all the alphabets and numbers. He probably thought the whole thing was a game and we cheered him on whenever he got something right. We then went out of the room and then met up with Ian who's a really funny and friendly guy. He took us to another room to test Imaan for sensitivity to different colours. Ian uses kinesiology (muscle testing) and this makes him the third practitioner we have seen, who uses it. It appears that Imaan is sensitive to red light and orange/ yellowish light is the most suitable for him. It has been found that a lot of children with autism having this problem called face blindness where they have trouble recognising people's faces and the colour therapy has been found to be helpful in some cases. This involves wearing special tinted and individualised lenses which allows them to focus better. It seems to have some associations between reducing the stimulation of light and helping with the auditory processing difficulty. We then had a chat with Ian about Imaan and he prescribed glasses for Imaan with the special yellow lenses. Imaan was really cute and looked like a small Harry Potter. He is used to wearing sunglasses and we are hoping that he will wear the glasses once we get it. They would be posting the glasses in a couple of weeks and the great things is that because he is part of the NHS, the glasses are completely free and we only pay for the postage. I was delighted that Imaan was at his best behaviour even though he was fascinated by their portable air conditioner and was turning it off and on. We then spent some time at the beach which was a short distance away. The last time Imaan had been to a beach was at La Rochelle in 2008. He was really afraid of the sea then but this time he was really happy and was running around the beach playing with the sand and water. Wish we could have spent more time there. Maybe next time.